Are you traveling to Saudi Arabia with a bunch of kids? Do you love watching and taking pictures of animals? Then, make sure to plan a visit to the Riyadh National Zoo, the largest wildlife sanctuary in all of Saudi Arabia. 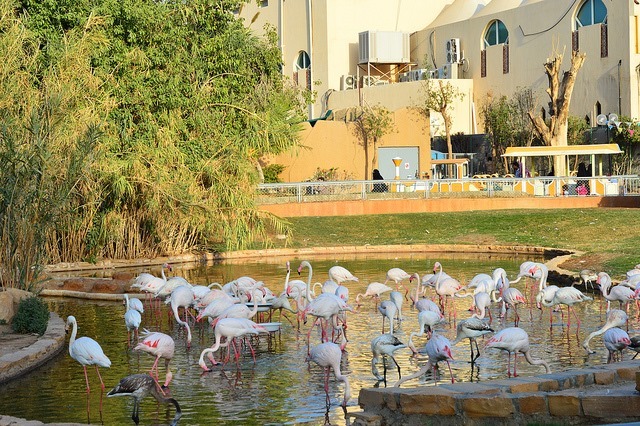 Located right at the heart of the city of Riyadh, this 55-acre zoo is a popular tourist attraction that will give you heavy dose of fun and entertainment, as you visit Saudi Arabia. While the zoo was established in 1957, it wasn’t available to the general public until 1987, after it was refurbished. Initially, the park had a very small land area, and was made up of a few animals, which were given by Saudi Arabia’s ruling dynasty members. But later on, the sanctuary’s area was increased in order to accommodate more animals as well as allow them to enjoy living in a wider and more open space. This vast animal sanctuary isn’t billed as Saudi Arabia’s best and largest zoo for nothing. After all, it is a charming wildlife park that houses over 1,500 fascinating animals that represent more than 35 species. Here, you get to lay eyes on a plethora of wild and vicious animals, including snakes, crocodiles, reptiles, rhinoceros, vultures, lions, hyenas and leopards. Of course, this zoological garden has plenty of tamed animals as well, such as gazelles, camels, elephants, kangaroos, monkeys and a whole lot more. Aside from its wide collection of animals, the zoo also has a handful of facilities and attractions that can keep your kids entertained for a few hours, such as its quirky traveling train. What’s more, the zoo flaunts occasional shows that display the wits and talents of their housed animals. For instance, before the park closes, some of the zoo’s harbor seals would show off their talents and skills to get hold of the food offered by their trainers. There are a few important regulations that you have to keep in mind, as you plan a trip to this zoo. For instance, parents or guardians should accompany their kids at all times when visiting the zoo. Also, take note that there are separate days for visitation for men and women. Men are allowed to visit this attraction on Friday, Wednesday and Monday. Women, on the other hand, may swing by the wildlife park on Thursday, Tuesday and Sunday. As for the opening times, the zoo is open from nine in the morning to six in the evening every day, except for Saturdays (maintenance).